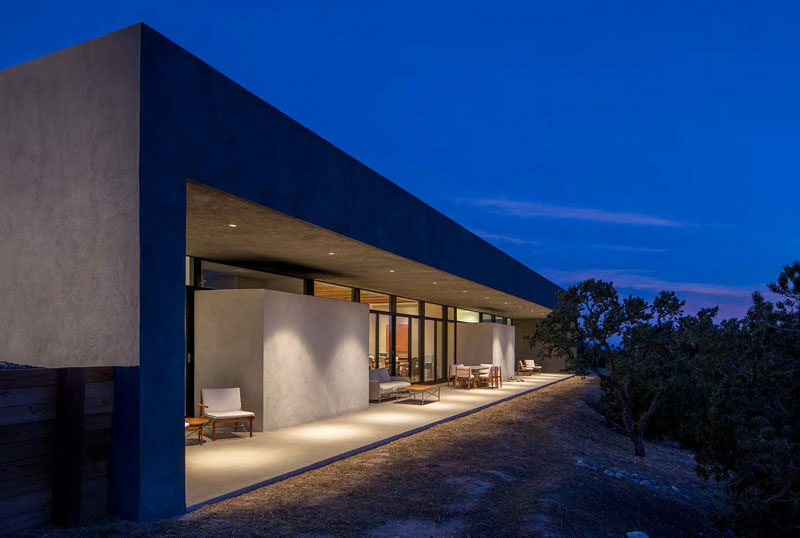 Specht Architects have recently completed this modern home in Santa Fe, New Mexico, that’s organised around two perpendicular board-formed concrete walls. 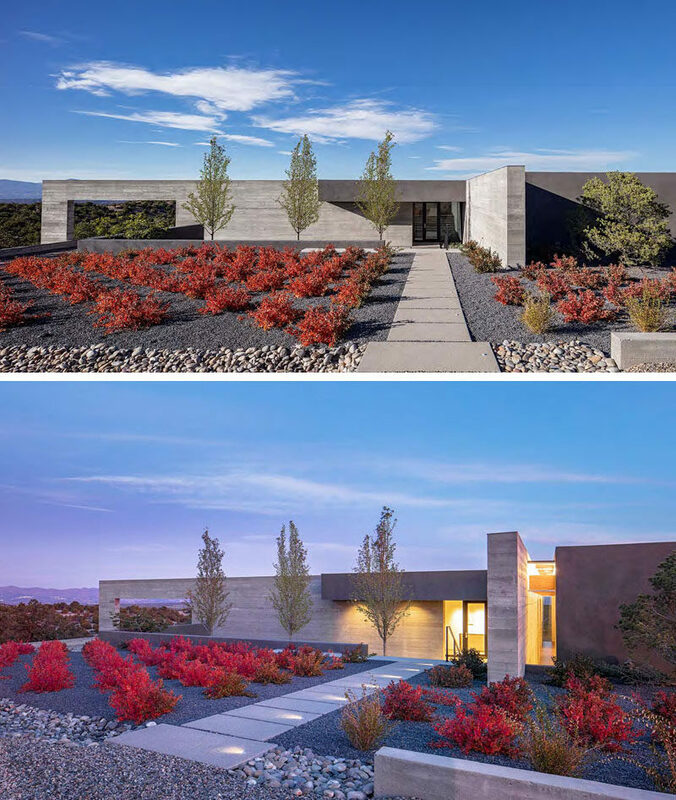 Landscape architect James David designed the gardens all around the home, with rows of colorful plants and dark gravel making the light path stand out. Stepping down from the path, which is lit up at night, you reach a recessed courtyard with a simple water feature. 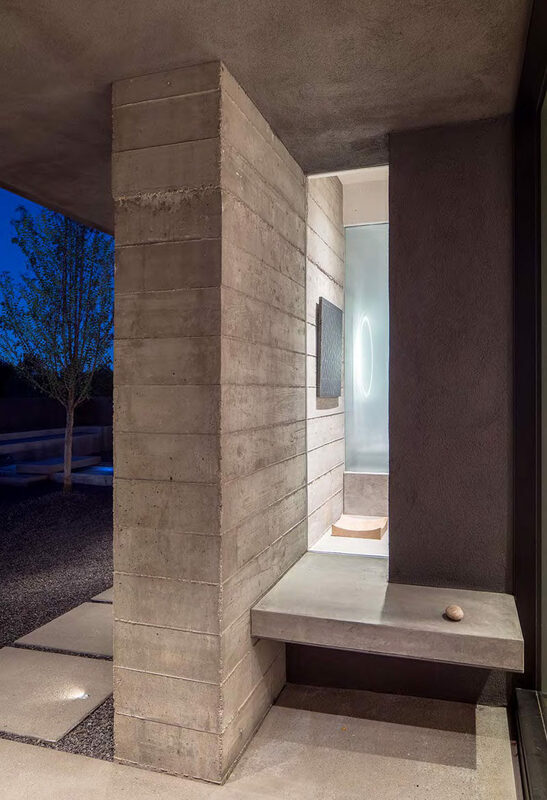 Just before walking through the front door, there’s a small built-in concrete bench with a window that gives a glimpse of the interior. 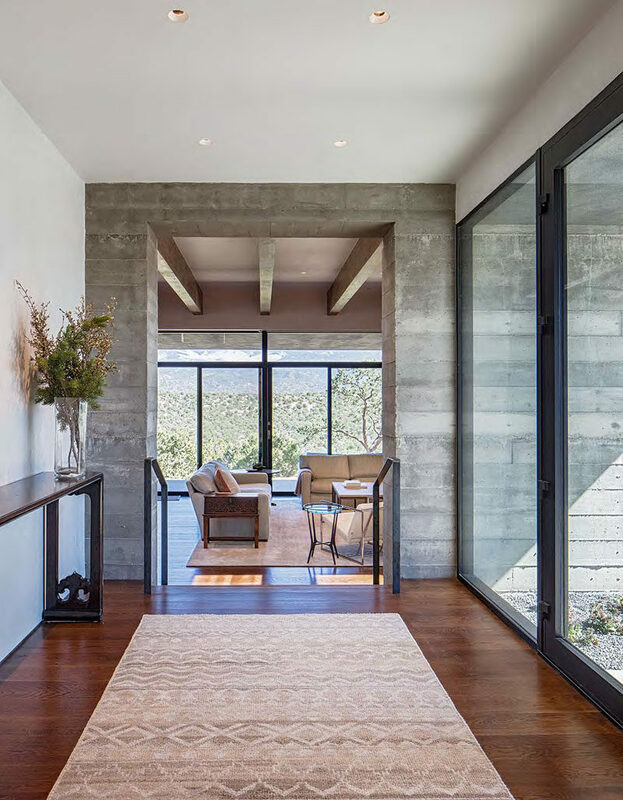 Stepping inside, there’s a foyer that leads to the living room. From this angle, you can see part of one of the board-formed concrete walls. 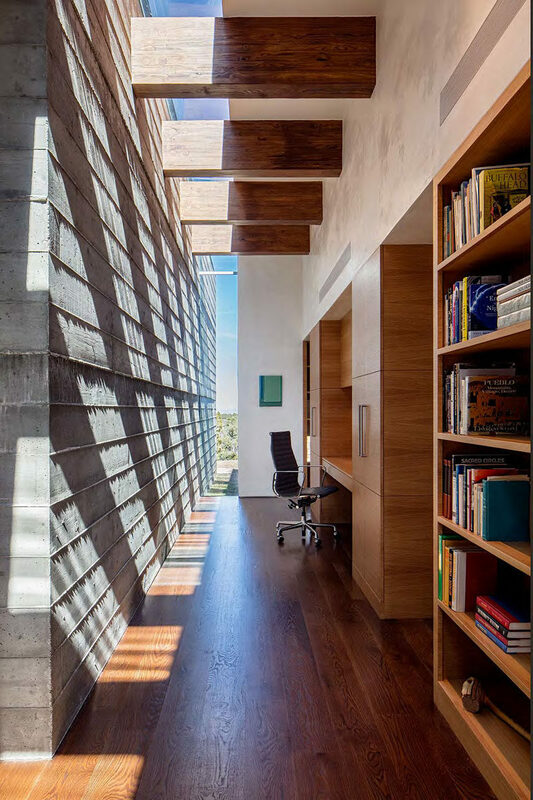 Stepping down from the foyer, sunlight shines through a narrow skylight that runs the entire length of one of the walls (125ft), and casts shadows throughout the day. 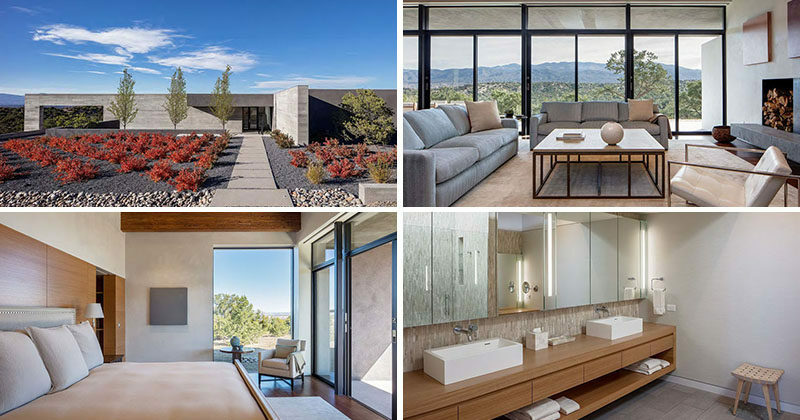 The architects worked together with interior designer Norine Hayes, to create a simple, elegant and comfortable space. 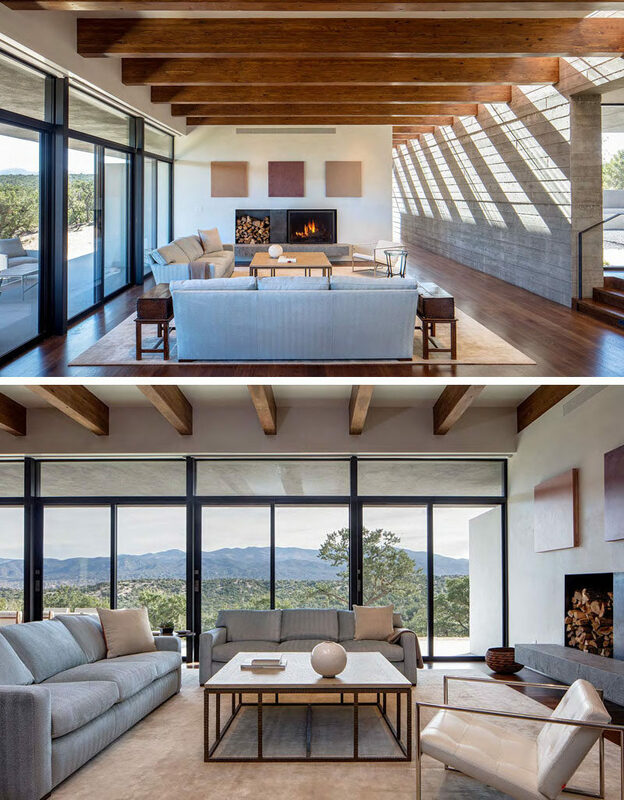 The living room has panoramic views of the Sangre de Christos mountains through the large windows and sliding doors. Around the corner from the living room is the kitchen, where wood cabinets are broken up by white countertops, tiles and additional cabinets. 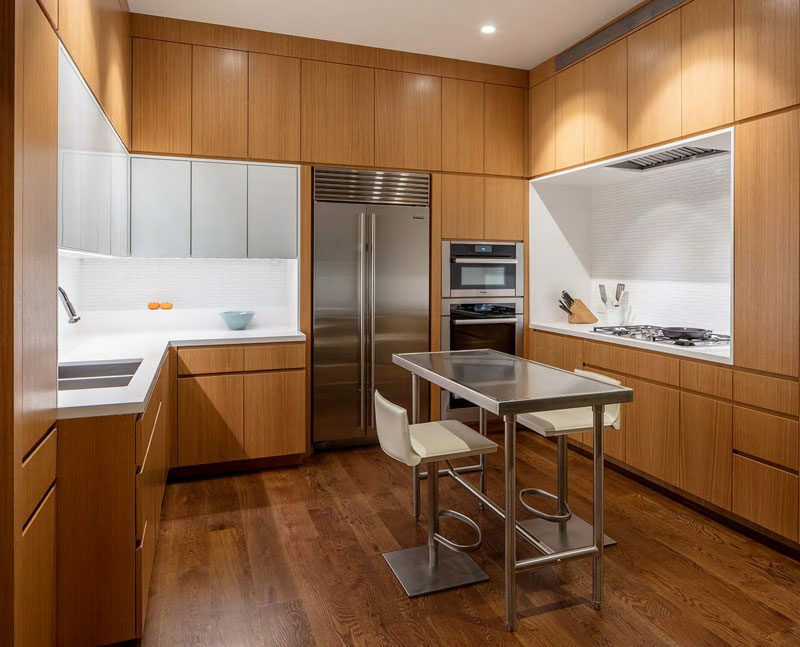 A small stainless steel island ties in with the stainless steel appliances. 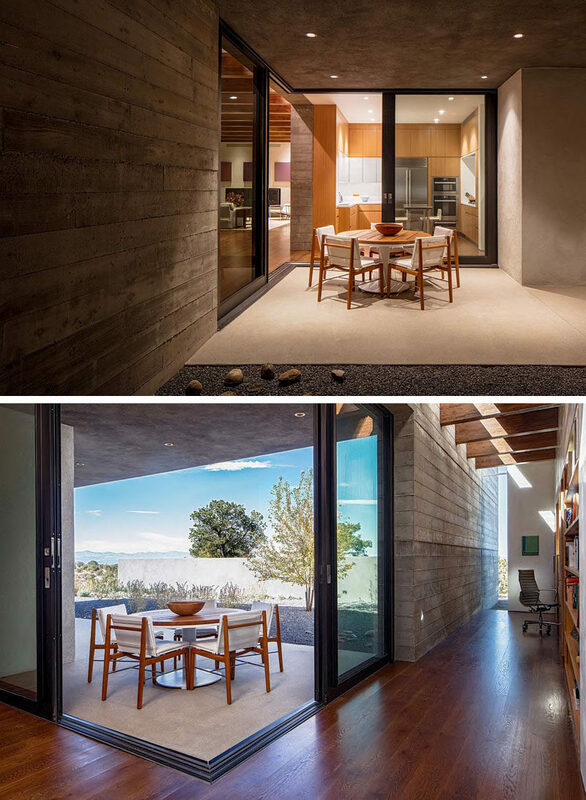 Just off the kitchen is a covered outdoor dining area that’s accessed through two sliding doors that open on the corner. Next to the outdoor dining area and back inside, there’s a home office in the hallway, with a built-in wood bookshelf and a desk. This hallway also leads to the master bedroom. 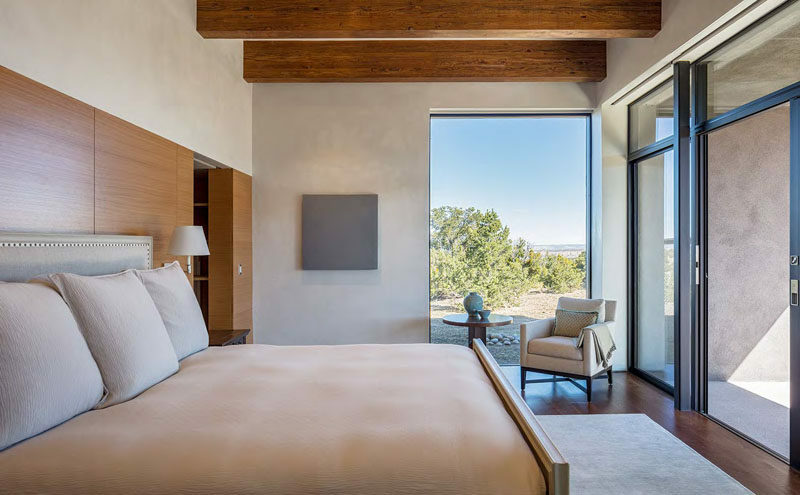 In the master bedroom, large windows provide picturesque views of the surrounding landscape, and sliding glass doors allow the home owner to enjoy the porch directly from their bedroom. 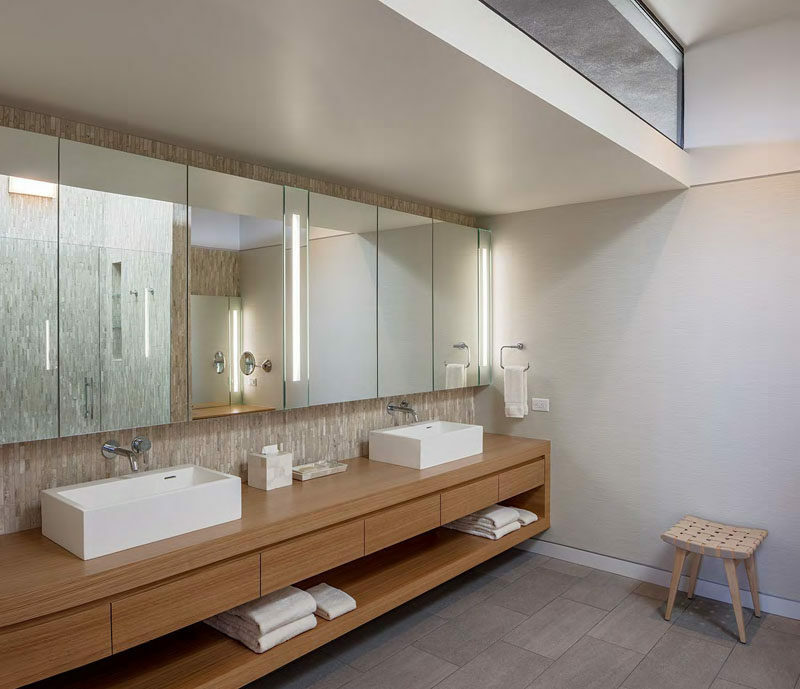 In the master bathroom, natural light from the clerestory window filters through to the space, while large mirrors fill the width of the wall. A floating wood double-sink vanity has plenty of drawer space and open storage. 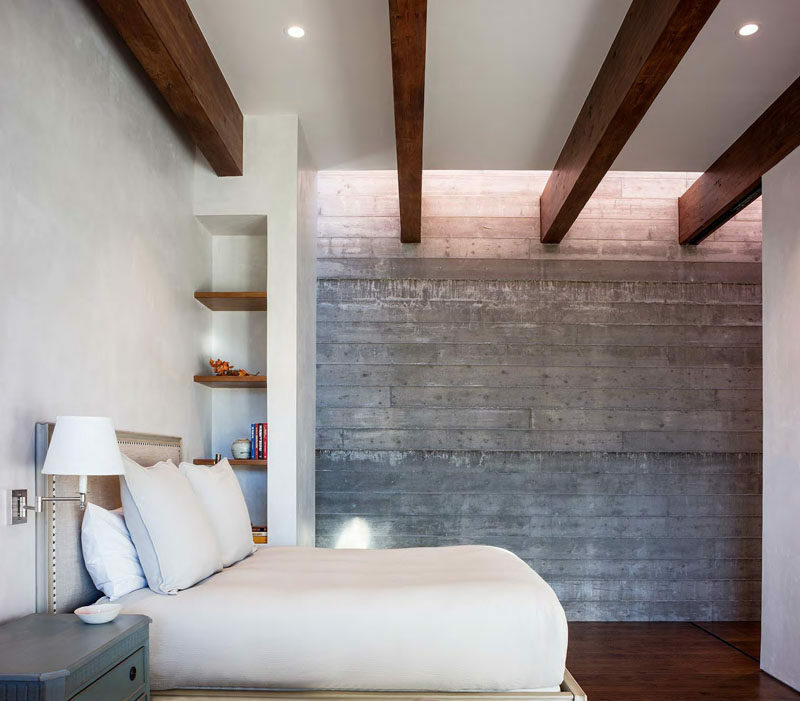 In the guest bedroom, the concrete and white walls are broken up by the use of dark wood beams, shelves and flooring. Outside the rear of the home is a porch that runs the length of the house. 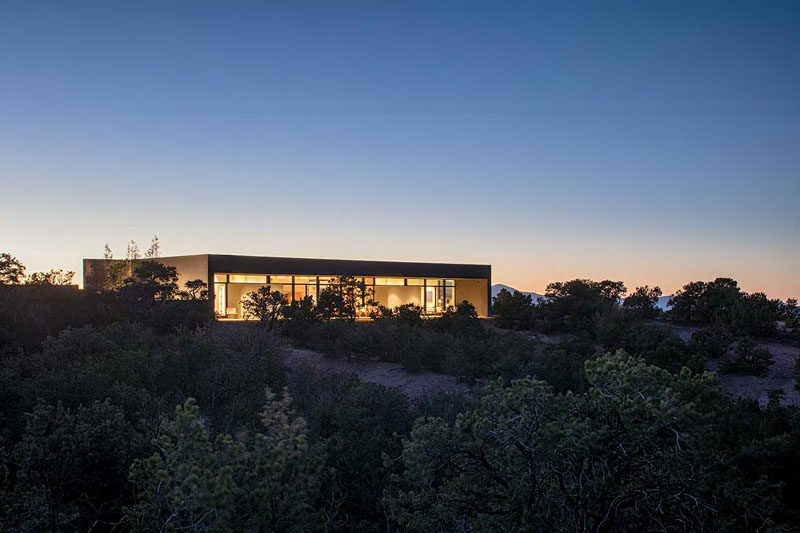 The outdoor porches are shaded by a cantilevered roof, provide a space to relax out of the sun. 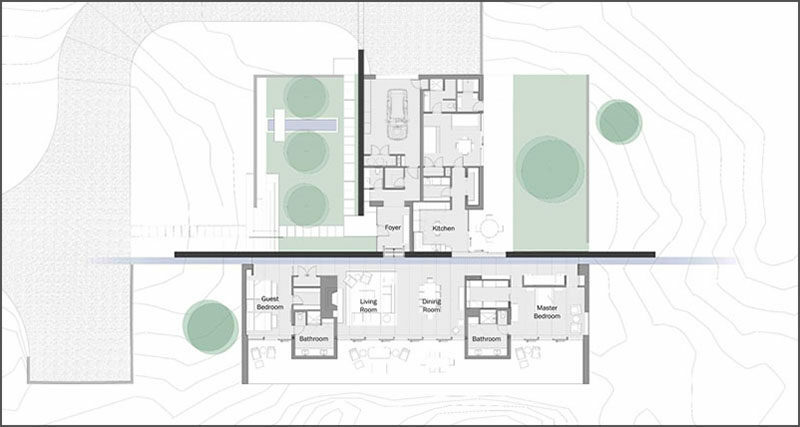 Photography by Taggart Sorensen | Contractor: Wolf Corp.
Here’s a look at the floor plan of the home, so you can see the two perpendicular concrete walls that run throughout the home.